The firm, with offices in New York and New Jersey, is a powerhouse of legal knowledge and experience devoted to representing clients who have suffered serious injuries due to medical malpractice and accidents. Founding partner Paul Simonson, one of the nation’s leading attorneys in the area of weight loss surgery malpractice, says that he and his partners understand the importance of branding and internet marketing. “We have approximately 90 years of combined legal experience, and it’s experience that counts when we’re fighting for our clients. Our website needs to engage prospective clients and tell the story of our experience, expertise, and ability to win their case.” Simonson chose Trighton Interactive, a full service digital agency based in Orlando, for the job. Having previously worked with Trighton’s CEO and internet marketing expert, Jody Resnick, on highly successful digital strategies, Simonson knew the law firm was in good hands. From the sleek homepage to the descriptions of the firm’s areas of practice, Simonson Goodman Platzer PC’s new website says quality. The color palette, typography and organization blend elegantly to give prospective clients a sense of the high quality representation they can expect from the firm. 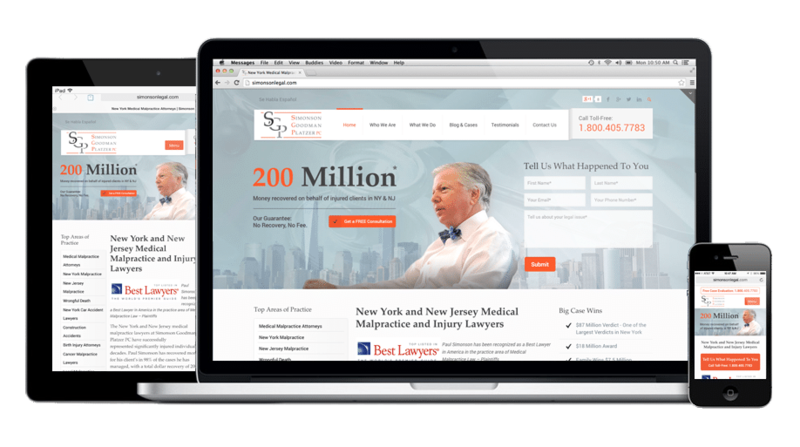 In addition, the site’s navigation and content help prospective clients easily access the information they need to get started on their medical malpractice or personal injury case by scheduling a free consultation with the expert attorneys at Simonson Goodman Platzer. To experience Simonson Goodman Platzer PC’s new, responsive website, go to www.simonsonlegal.com.